I own a lot of packs. Because of the number of different activities I do, I have an extended trip backpack, a bike pack, a running pack, and several other packs in various sizes for day hikes and overnight/weekend trips. It sometimes seems a little excessive, so I had to chuckle to myself when I decided I needed a new overnight and weekend pack this spring. For the last few years for most trips, I’ve been using an Osprey Argon 70 litre. Unfortunately, that pack is generally way too large unless you are doing an extended backcountry trip. Without being fully loaded, I found the pack gets a little floppy. Tightening the load straps and such does help, but since the pack itself comes in at 6lbs, it’s just too much pack for smaller loads. A couple of times this year, I had also dusted off an old Asolo 40L pack but I found it was a tight fit and just not quite comfortable enough for a long day of backpacking. That was all the justification I needed to purchase a new pack but I did want to do this on a budget, so I was aiming to keep the cost under $200. I had borrowed an Osprey Kestrel 48 and had the chance to buy it used for a good price. After fake loading it and wandering around my house for awhile, I realized this was not the pack I wanted. I love Osprey packs and they have not let me down, except for one thing. I have an Osprey Stratos 24 as my go-to pack for day trips or long days on my bike and it fits quite nicely. I have noticed, however, that if it’s packed heavily, it has an annoying tendency to bite into your back. Around the lower area where the straps attach to the pack, Osprey put a molded plastic shell without a lot of padding. In most cases, they are not a problem but on one particular long day where I had 20lbs in my pack (water, food, etc), I found it just dug into me. The Kestrel had the same setup so I was not willing to see if I would encounter the same issue with the pack. Hydration pocket with hose exit. This is a requirement. I don’t miss the days of water bottles hanging all over my pack bouncing around with every step. Everything must fit inside. I do not lash any gear to the outside of my pack except for a jacket so that it is in easy reach if I need it. Bottom zip pocket. This wouldn’t be a deal breaker for me but it’s a feature that I’ve always used. Ventilated back. Another nice thing to have. While I don’t think I’d die without it, it’s a good thing to have on long, hot days. Nicely padded waist belt. I’ve noticed some manufacturers don’t seem to pay attention to this. Integrated rain cover. Nice to have but not necessary. With that in mind, I went and checked out some of our local shops to see what was available. One thing about shopping in Kamloops is that there is not always a large selection available in the three or four stores that we have. I’m reluctant to buy a pack online without having the opportunity to try it on, so that does limit availability if one is in a bit of a rush. 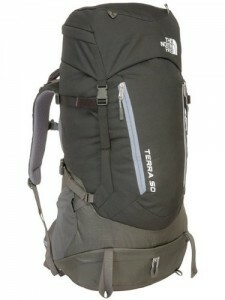 A few stores later, I had found the North Face Terra 50 on sale for $129. That was $50 off the regular price so it seemed like quite a good deal. I didn’t buy it on the spot, but decided to read some reviews of the three packs that I had checked out. In the end, it came down to the North Face Terra 50, the Gregory Savant 48, or a Columbia Endura. Like many backpacking items, most of the reviews I found were from other customers reviewing the items on the various sites where the packs were purchased. And of course, reviews are largely based on experience with the product and that can be a bit hit and miss if someone has had a bad experience. It came down to price as I wasn’t able to find any conclusive reviews of any of the packs that lead me to believe any was better than the others. And it was hard to beat the $129 for the Terra as that put it $30 cheaper than the Gregory pack and $70 cheaper that the Columbia pack (Kamloops prices). One of the fun things about a new pack is, well, how to pack it. I’ve been backpacking since I was a kid and I’ve owned quite a number of different packs over the years so I sort of have my method on loading. These days most of my gear is quite lightweight and highly compressible, which works well with my ‘all in’ philosophy of packing. There was a time where things like sleeping pads were strapped to the outside and while that may work for some people, it doesn’t work for me. After a bit of playing around, I figured out the best load out under different conditions. While there are items that are carried each and every trip, there are some items that may or may not be loaded depending on trip and partner. For example, I generally carry the tent and fly, Raegan usually carries the cooking set and fuel and we each carry our own sleeping pads and bags. Food is split between us as well, whereas we each carry our own clothing. When I’m with Kirk, we sort of alternate on the tent so if he brings his, I’ll carry cooking gear and fuel. I got my first trip in with the Terra pack when I attempted to do the Larch Hills Traverse trail. All in with extra water and my usual gear, I came around 28lbs, which is about right for most of my shorter trips. I ended up carrying the pack for 33km in one day and overall, the pack felt quite good. I’ve since had it out for a couple of other short overnight and weekend trips and so far, I’ve been quite happy with it. Little things like the velcro straps on the outside, where I hang my jacket, and the two back pockets have proven to be helpful. Would I recommend this pack to anyone? Certainly; but like most gear, we all fit differently and have different body shapes and sizes, so results might vary.